Moody, Art Deco inspired and with glorious views. With the reality of the present. For more nostalgic skies, please visit: Skywatch. 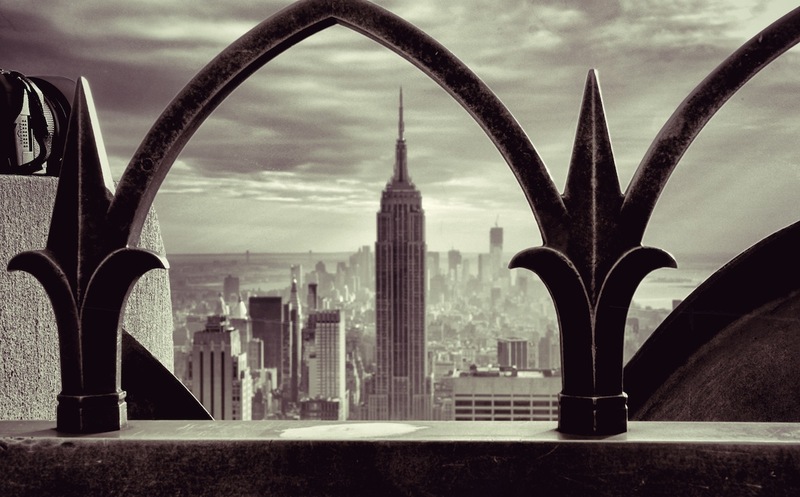 Posted in photography, SkywatchTagged 1930s, architecture, Art Deco, Empire State Building, New York, nostaliga, past, present, Rockefeller CenterBookmark the permalink. Art Deco has many things to learn for architecture students. Great view. Loved the picture and your interpretation. It looks so spooky. Maybe a New York of the future? Brussels probably is the best place to see some stunning art deco building in Europe. >Is it as warm this year as last? Been raining a lot these days. Very nice post-processing, definitely gives it a vintage look. I have a real soft spot for art deco arcitecture. Ladyfi, thou makest me speechless again! What a wonderful eye catcher of a photo. Great shot! Good eye you have for best shot!! Wonderful picture with a stunning frame. Delightful B & W.
Terrific capture and it is like looking back in time! I love it! Have a wonderful weekend! Fabulous bird’s eye view! Love your monochrome skies. It is a great shot. I’m not sure I would have noticed the camera without you mentioning it. What a wonderful feat of imagination you’ve shared – that’s a wonderfully moody image! Very artistic and beautiful shot. I really like what you’ve done with this photo. I like the color (moodiness) and the way you’ve framed lower Manhattan. Very well done. What an awesome, timetraveling and time unifying photograph. I love how you did this. Hi There, You did a great job with that photo….. Love it!!!! Wonderful view of thew city. Loved the Art Deco look that the railings with the view behind, provided. Very artistic. Very arty, Fiona. I love this shot, and am not really art deco fan. Well done, it does have that vintage look about it. I am reminded of the movie with Cary Grant called “An affair to remember”. Thanks for sharing your wonderful skywatch. I love the blend of today with the look of the past. The City is so iconic in our collective memory — we do see the past when we visit it in the present. Perfect. Beautiful framing! I really like what you did with this photo. A superb photo, and no doubt about it! Very creative photo. I like this one very much. Very nice, I love what you’ve done with it. You have a great way of using the camera to capture imagination…and memories. Too bad the photo is made up – I’d love to see it for real. I’m glad you gave us an insight into your own fantasy world. It’s magic. My husband was tall building crazy. When we went to New York about 20 years ago, we went to all the tall buildings. I asked him if he was sad The Twin towers are gone, he kept quiet. Awesome capture! Love your composition and the colours! I didn’t notice the camera until you pointed it out. I was riveted to the building. The hazy background adds to the vintage feeling of the photo. Awesome photo!I love it!Have a nice weekend! NOT the usual NYC tourist picture! That’s cool 🙂 beautifully captured and well presented. An amazing feeling of getting a mystical glimpse of the past through the window of the future! Beautiful! Such a great photo for SWF. As you can see from the comments above, it is a HIT! Love this! It’s food for the imagination! This is one nostalgic sky. I love the way you left the camera where it was. Awesome photo, love the art deco look that you have applied to it. Fiona, you nailed it! Great job! The 1930’s for sure! Exquisite! Have a great weekend. Perfect, even I think it would have looked like that. Looks like a shot from an old movie. A perfect image, wonderfully composed. A very artistic capture… i love how you framed the tall structure with the that fence. 😀 happy weekend! Beautiful photo, so nice to look at! this is one awesome photograph! Awsome shot! I love the monochrome and the art deco look of your photo. It looks like right out of a 1930s or 1940s movie! I love your processing – a true work of art!! Would you mind revealing what editing program you used? Sure! In fact, I can’t quite remember how I achieved this as I was just playing around with some pre-sets in a Mac program called Snapseed. A classic shot, perfectly composed. But that camera out on the ledge makes me a little nervous! A very beautiful photo. I love the nostalgic image. Thank you for visit Green Tomato. I have joined you! I love your vision of the past. What a lovely photo!! It makes me feel I am looking into the past!! Wow LadyFi!!!! Love love it! I like the idea of the old photo next to the modern camera. Great picture taken from a nice place. lovely thoughts and a brilliant photo! · I remember that amazing building from Empire state. What two wonderful little cottages!!! What a great effect. I could easily believe we were looking at the past.